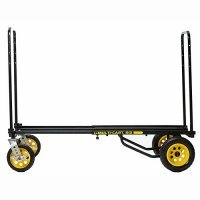 The critically acclaimed Rock-n-Roller Multi-Cart 8-in-1 Equipment Transporters takes place of many current material handling solutions: convertible hand truck, platform dolly, basic hand truck, long nose dolly, furniture cart, and with the optional shelves even a rolling utility cart. 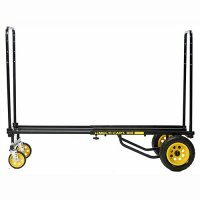 Fact is the Multi-Cart is the solution for those that don’t know what they’ll move next. 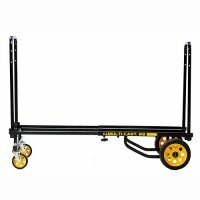 This convertible cart is perfect for both Facilities Management, Industrial use, and all around general use. The patented design instantly transforms into any of 8 configurations to fit any equipment size or shape replacing the need for 8 different carts. 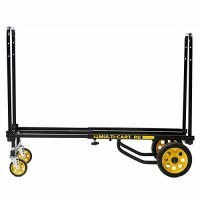 Multi-Carts® quickly and ergonomically move huge amounts of gear yet fold small for storage. So innovative they are even featured in college engineering textbooks for outstanding design. Custom-designed R-Trac no-flat wheels feature pneumatic tire like cushion ride, low rolling resistance, high strength polymer hub, extremely light weight, and no-flat capability. 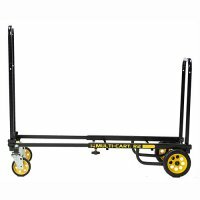 The new Multi-Carts® are 10% lighter in weight making them even more maneuverable and efficient. Strong steel tube frames with tough textured finish to resist load slippage. Designed for professionals where speed and efficiency are crucial, Multi-Carts can reduce time and effort moving equipment by 50% or more. Now used by major medical facilities, TV networks, news crews, sports teams, Fortune 500 companies, and thousands more.